This handsome, 14-story building, which was designed by Herbert Lucas, was erected as a cooperative in 1909. It has a two-story, rusticated limestone base and 33 apartments. The facades are boldly composed with large windows and curved wrought-iron balconies, flared window-top decorative elements and some diamond-shaped decorative elements on some spandrels. 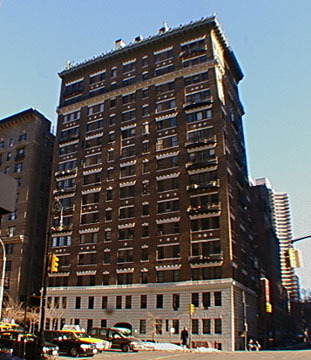 The building, which has inconsistent fenestration, no health club, no garage and protruding air-conditioners, has a choice location convenient to midtown, fashionable restaurants and boutiques, clubs and religious institutions and very attractive sidestreets. There is a fair bit of traffic in this neighborhood, but it is also close to public transportation.